Brighton Rocks is a stylish restaurant and bar. They offer excellent food with an impressive selection of drinks. This fun loving venue is intimate and stylish and great no matter what the occasion. What did you think of Brighton Rocks? The best sunday roasts you're going to find can be found here. Once you have been here once you will be hooked. Booked for a 30th birthday. Double booked and so put us in the small room where there was not enough space and the public were allowed to use. Told it was our fault and to get over it. Do not book for private party. 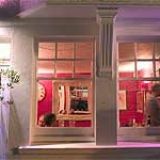 Absolutely exquisite food, delightful staff, great value for money, fantastic atmosphere, all in all, a brilliant night out! A group of us (4 couples) recently visited Brighton Rocks. I think they've just done it up as someone in our group said it used to look a bit tired. Well whatever they've done we all loved it. It's an old building with plenty of character which they've really made the most of with the decor. We loved everything from the decor, the staff, the music and the other very mixed, friendly customers. It had a great 'feel'we only popped in for a drink on our way into town but when we saw some of the food being served we decided to stay. It's rare that all eight of us (very picky) foodies like everything we ordered, especially in a pub, but Brighton Rocks scored top marks for the food and then equally top marks for the cocktails. The guy serving us could match any cocktail specialist in any of our favourite bars in London. We ended up having Sunday Roasts there which lived up to our previous experience. They could do with an extra loo for the ladies though. Brighton definitely rocks and so does Brighton Rocks! Great place, fab cocktails, cool staff and clientele. Recently rediscovered this place after a long absence. I went back reluctantly as it had been badly neglected in the past. I really enjoyed my evening there. Four of us went for dinner and had a kind of british twist on tapas or taster style menu I suppose you could say. Everything was fresh and tastey. It was good value, the cocktails were great and the staff were lovely. Well done! A group of us managed to while away a whole Sunday night in Brighton Rocks and we had a great time. The staff are friendly and attentive, they do little snacks at night which are great and must be a real money spinner. It’s not cheap with wines here costing a little more than some bars but I have to say I don’t mind. We will be back very soon. The food here is delicious and such good value for money. Staff are friendly and realy helpful with drinks ideas from their massive selection of spirits. The place looks amazing and when i came at night it was all lit up with tea lights very cosy. Went back to Brighton Rocks recently on a Saturday night and it was buzzing. There was a really good atmosphere and an eclectic mix of people, I had heard that this was a gay venue, but I didn't feel that at all. The staff were friendly and the cocktails were great, I had a Kamikaze made with Hangar 1 Kaffir Lime vodka, it was immense! I'll definitely be back for Bar Soulshyne next week with Mick Fuller. Any bar named Brighton Rocks is never going to be anything less than a raging success in a city so proud of its history and influences from the worlds of music, art and film. 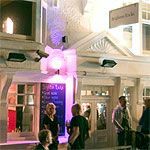 Despite being tucked away from the main drag down Rock Place, gay bar and restaurant Brighton Rocks advertises itself unashamedly with a bright pink banner all the way across the front. There's a raised decked area out front, complete with pink umbrellas and gas heaters and a view of the sea. Open till midnight in the week and till one in the morning on Saturdays, the bar has been recently taken over by new management so some changes, although largely cosmetic, are afoot. The restaurant area is one of the most intimate, smart and stylish of its kind in Brighton, consisting of a row of tables along the wall flanked by a burgundy banquette and sporting modern art on the walls. At the other end of the bar is a small, cosy lounge area. A cultured and cosmopolitan crowd fill the bar until it's straining at the seams and although it may seem a little squashed at times this is a small price to pay to drink in surroundings where intelligent, fun conversation is practically a pre-requisite. On tap are Kronenbourg, Carlsberg, Guinness and Grolsch. Cocktails flow at night with a wide range on offer including Apple Crumble, Chilli Mojito and Toblerone, as well as the more classic Caipirinhas and Margaritas (all for around £5-£6). 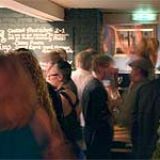 The food is tapas style which is fitting given the mixture of personalities and nationalities the bar attracts. 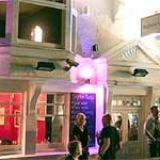 For a stylish night out, with great food thrown in, there are few better bars than Brighton Rocks.